Be11eBunny Locked Down for 11/28 Podcast! Some More Exciting News to Share as xAllegiancex has just locked down another Special Guest for our Official Podcast! On November 28th at 8pm EST Our Special Guest will be Be11eBunny! Don't know Who Be11eBunny is? Let's take a look at her credentials! This should be a great interview with Bunny as she is in a lot of different things from being a founder of a successful community to co-hosting a very popular destiny radio show! I look forward to the conversation with her and having her add a ton of value to our podcast! Dames of Destiny was apart of Bungie's Community Spotlight done by DeeJ back in Februrary of this year. Take a Look at the write up Below and get to know the community she runs! Bungie.net is home to a sprawling army of Clans whose combined forces could defend any city, be it real or fictitious. Each of them adds their own flavor to the community. Some of them are gatherings of specific friends. Clans like Dames of Destiny cater to a very specific demographic of online warrior. Who are you fine people? Where might we find you? 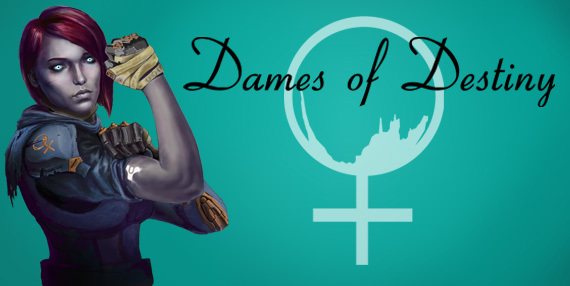 Dames: Dames of Destiny is an all-female Destiny clan, open to all consoles, ages, and gaming levels. You can find us on Bungie.net recruiting for the PlayStation 4, PlayStation 3, Xbox One, and Xbox 360. We're also reworking our website to provide updates, media, and more – including a Dames podcast in the works. Our Twitter account gives the best updates on all these changes. We also regularly stream together on Twitch. All that media will need a strong message to support it. What would you say is your shared mission? Dames: Our mission is to provide a positive, safe, fun environment for gamers who happen to be female. We strive to be accepting and supportive, like a family to all our members. We have an extremely diverse group of members, ranging from casual to pro. We have launch players and Kinderguardians. Our youngest member is just eight years old, who signed up with her dad’s permission. Our oldest known member is in her 70s, whose son helped us connect with her! We cover just about every time zone on the map. One of the things that makes me the most proud of this amazing group of women is how truly positive they stay when gaming. I have watched a Dames group run a Raid for the first time for hours and hours, and not once did I hear an angry word said to another Fireteam member. Instead, I heard laughing and joking and saw Guardians dancing. That is what Dames is all about! With so many Dames approaching their pastime from so many walks of life, how do you keep them all organized? Dames: Originally, when Dames was created back in October 2014, I had thought it would be a mere fifty members, tops. To my surprise and joy, we continue to connect with more and more female Destiny gamers. Our numbers are around four hundred Dames, with many pending members. We maintain an Alliance on Bungie.net so that all current Dames can be found in one place. Our amazing admins and officers help keep us organized in so many wonderful ways. Some awesome advice has been given to us from ally clans like Dads of Destiny on how to keep members organized. What are some of the unique challenges that you have faced as a community? Dames: A number of our members joined Dames because they experienced a lot of negativity in the gaming world. They were searching for a safe, positive, female gaming community. I’m so happy when we receive positive feedback from members who are happy they found Dames. That’s what makes it all worthwhile! We celebrate all gamers who are positive and supportive, no matter their gender. We created SafeGamers for the people who did not qualify to join Dames, but enjoyed the positive atmosphere we have. SG is our ally clan for the whole Destiny gaming community to join. Each incoming member is screened by a Dame or fellow SG member. If they pass inspection (aren’t a total jerk during a game) they are added to the official roster. Tell all those loners out there why being in a Clan is cool. Dames: Being in a clan makes the experience of playing Destiny so much more fun. You have a group of people who can become like family to you. Dames often hold Raid races, which we stream live. This adds a whole new level of entertainment and fun to the gaming experience. Two of our members, ladylion and LadyM_Asesina, created special events to teach people about the Raids. “RAIDucation” is a great chance to ask questions. It's run on Fridays with the help of experienced Dames raiders. According to Co-Leader Morcoire, we have a wide variety of experience levels. This means those of us who need a little extra help have a large group of people willing to lend a hand. For our more experienced Dames this helps keep the game interesting. You may already have three level 32 characters and countless Exotics, but leading a new Dame through her first Raid is still immensely rewarding. How do you go about recruiting new Dames to join your Alliance? Dames: We are always recruiting new members. The best referrals have always come from ally Clans, supporters, and Dames themselves. Many of the Dads of Destiny have shared our link with their significant others. Whenever we receive a member request, we send a welcome message along with directions on how to verify themselves as female. Once verified, they are officially welcomed into the Dames family! What can Bungie do to make the Dames a stronger clan? Dames: We had a number of suggestions along the lines of wanting an in-game Clan friends list, so a Dame could have a list dedicated to just her online Clanmates. This would make gathering a Fireteam much easier and quicker. Can’t argue with that. Any other words of wisdom from the Dames? MommaYork: Dames are Dames because we can play together without getting mean-spirited. Our leaders trust us to help them build a great clan and we take that responsibility seriously. As long as we stay brave and keep focused on the fun, we'll be around for a long time. We're Dames - we game and we're damn good at it. Queen_bean: If not for the Dames, I wouldn't be playing. Playing online is tough when you don't know anyone else who plays, especially if you need a group of six. For those of us who have never played online multiplayer, it's daunting. The Dames have been welcoming and encouraging, and just so much FUN! purple-blizzard: We continue to grow stronger from support by the Destiny community. The community is what keeps us going. Ever since the Dames were formed, many female gamers have joined because of our safe, laid-back environment. We're all here to have fun while playing a game. Without Destiny, many of us wouldn't have become good friends like we are today. If you’re interested in that sort of scene, there are a lot of ways to get involved. If the Dames have inspired you to start your own clan, there’s always room in the community for yet another flavor that gamers can appreciate together. They got great reviews from Deej and the Bungie Community. This is a Great Booking Deal Stevie. I am really looking forward to this. Very Exciting !!!! Very huge news indeed!!! Can't wait.